Home » Activities » Willing to renew your wedding vows? Why not Indian way? Willing to renew your wedding vows? Why not Indian way? 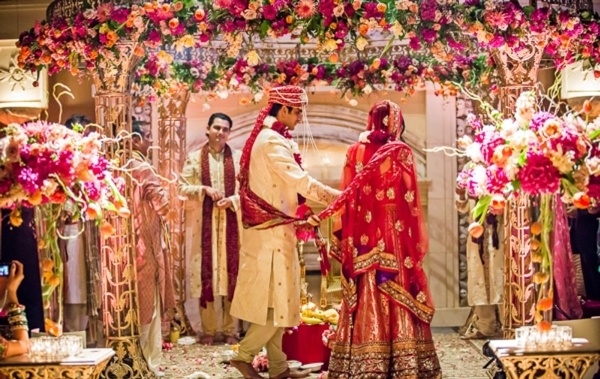 The most important features of the Hindu wedding are the “saat phere” meaning the seven circumambulations. It involved seven rounds around a fire. The groom and bride recite vows or Vedic mantras. In the first round or phera, the couple prays to God for plenty of nourishing and pure food. In the second round, the couple prays for a healthy and prosperous life. They ask for the physical, spiritual and mental health from God. In the third Phera the couple prays to God for wealth. They ask God for the strength for both of them so that they can share the happiness and pain together. The bride and groom together pray for the beautiful, heroic and noble children in the fifth step. In the final seventh round the couple prays to god for companionship, togetherness, loyalty and understanding between themselves. They ask God to make them friends and give the maturity to carry out the friendship for lifetime. The husband says to his new wife that now they have become friends and they will not break their friendship in life. Quiet nice, no? Well, you can now surprise your half by an original way to renew your vow. The tour organizer Walk and Pedal in Udaipur organize for you a full day Indian wedding. You will get the traditional Indian bridegroom attire with accessories and get married by a Brahmin priest, a Pundit, reciting the mantras. They pick and drop your from your hotel. So romantic! Price is around 45000rs. Priests are expensive! ← Khajuraho, a perfect stop on the way to Varanasi!